Khoresht-eh Gheimeh is a stew made of cubed beef or lamb, tomatoes, yellow split peas, onions and limoamanni (dried limes). 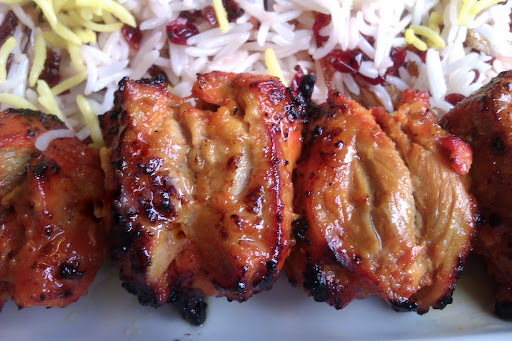 It is traditionally garnished with thin crispy potato strings and served over basmati rice. Khoreshteh Fesenjoon is one of the most popular and hearty of all Persian stews. It is made with ground walnuts, pomegranate molasses and chicken – an unusual but delicious combination that blends tart and sweet flavors for an exotic treat. Best served with saffron basmati rice topped or on top of tadeegh (crispy rice). A family favorite! Zereshk polo is made with zereshk berries (barberries) and saffron. It is a delicious accompaniment to koobideh (beef) kabob, barg (filet mignon) kabob, joojeh (chicken) kabob, lamb kabob or any type of baked fish. My familiy likes to sautee salmon with garlic and fresh lemon juice to serve with zereshk polo. Tachene is a yogurt, chicken and rice dish. It is deep-dish baked in the oven at a high temperature for 2 hours making a crispy tadegh crust on the outside while keeping a moist chicken and rice interior. Tachene makes a wonderful comfort food. Its mild flavors and ingredients will please a wide audience and is a great intro to Persian cuisine for those with less adventurous food tastes. Also a favorite among Persian food lovers. This delicious sweet and sour rice dish is served best with joojeh (chicken) kabob or koobideh (ground beef) kabob. The unique flavor of tart cherries with crunchy nuts makes it one of my f avorites. Enjoy! 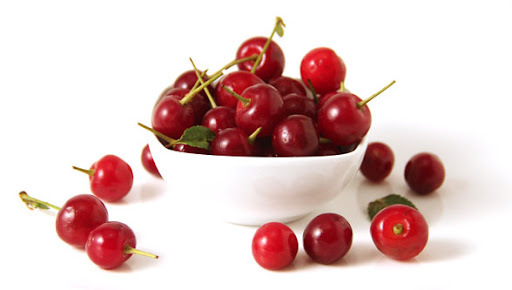 ** in place of fresh sour cherries, you can use Sadaf sour cherries in light syrup. Just drain the syrup and reduce the amount of sugar to 5 Tbsp. 1. Toast the almonds in a dry skillet on medium heat, stirring to prevent burning. Once brown, immediately remove almonds to a bowl. 2. Dissolve the saffron in 1 tablespoon of hot water. Add to cooked basmati rice and season with salt. 3. In a small skillet on medium heat, melt the butter with the sour cherries, sugar, and water stirring until the sugar is completely dissolved and cherries soften. 4. 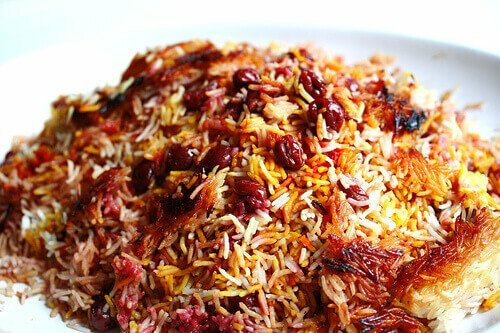 Combine the sour cherry mixture with the saffron basmati rice, stir together gently. Spoon onto serving dish and garnish with a few toasted almond slivers and sour cherries.